The finest house in Cornwall, superbly set in wooded parkland of 450 acres and encircled by a garden of rare shrubs and trees, lovely in all seasons. Come in good time to view the 49 rooms ranging from the richly furnished main rooms reflecting Victorian comfort to maids' bedrooms, the great kitchen and the newly-opened Nursery Wing. First built in the 17th century and largely rebuilt after a fire in 1881, the principal rooms all have beautifully worked plaster ceilings, including that of the Long Gallery magnificently illustrating Old Testament scenes. Through the crenellated gatehouse (1651) an idyllic walk down to the River Fowey at Respryn Bridge and back through the woods should not be missed. During the 16th century the Roberts family - later to change their name to Robartes, rose in affluence from their interests in the tin trade, as merchants and bankers. By 1616, Richard Robartes has risen to sufficient prominence to be knighted. 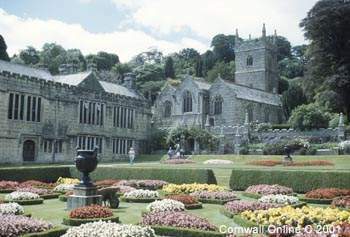 Lanhydrock - a monastic Barton (farm) and land had for a long time been a possession of the priory of St Petroc in Bodmin. 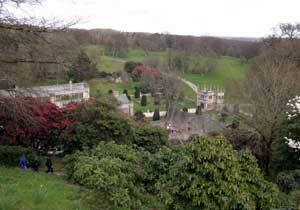 During the Dissolution, the neighbouring Glynn family acquired Lanhydrock. The estate passed by marriage to the Lyttelton family and later still, again through marriage, to Thomas Trenance in 1577. Sir Richard Robartes bought the Lanhydrock estate in 1620. Lyttelton Trenance - the son of Thomas Trenance - sold the estate to Sir Richard in 1620. During the year 1624, James I gave Sir Richard a peerage; becoming Baron Robartes of Truro, as he was wealthy enough in the King's view "to be a peer". Though, Lord Buckingham insisted that he should pay for the honour, or be fined to avoid it. The Barony cost Lord Robartes the sum of £10,000. Six years later, in 1630, Lord Robartes began the construction of a magnificent Tudor mansion - replacing the Barton that had been occupied by the Trenance family. 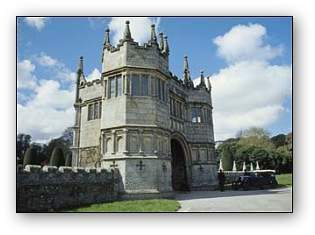 Lord Richard Robartes, who never actually lived in the house, died in 1634 and his son John, 2nd Lord Robartes was left to complete the building programme. In 1640, John, 2nd Lord Robartes who was already, at 36 years of age, the leader of the Cornish Group of Parliamentarians became Lord-Lieutenant of Cornwall. On the outbreak of the Civil War he immediately declared his loyalties to the Parliamentarians and set about the garrisoning of Lanhydrock. In the summer of 1644 the Royalists, under the command of Sir Richard Grenville, took control of the estate. John, 2nd Lord Robartes escaped by sea to Plymouth, though his children were held as prisoners at Lanhydrock. Later in the War Lord Robartes was appointed governor of Plymouth and was instrumental in raising the Royalist siege of the town. Thomas James Agar-Robartes, assumed the name Robartes in 1822. He inherited the estate from his mother in 1861. Thomas was created Baron Robartes of Lanhydrock and Truro in 1869. On the 4th April 1881, a disastrous fire destroyed the house, leaving only the north wing, the entrance porch and gatehouse. Lady Robartes, aged 68, was rescued by ladder from an upstairs window, but died a few days later, from shock. Lord Robartes who never got over the loss of his wife Juliana and the destruction of the family home; died in the following year. Their son, Thomas Charles Robartes succeeded as the 2nd Baron Robartes and began the reconstruction of Lanhydrock. On the completion of the House, Thomas Charles Robartes restored the adjacent church in memory of his parents. In the rebuild, the original grey granite was used resulting in a pleasingly symmetrical building laid out around three sides of a courtyard. The house, which is part of the National Trust, is open to the public, who can walk around 49 rooms that reflect all aspects of Victorian life, both above and below stairs. The kitchen, larders and dairy still contain the utensils and equipment needed to feed a great household and the cellars, bakehouse and servants' quarters are also open to the public. In the family's apartments the Long Gallery in the surviving wing is most impressive, with its superb plaster ceiling created in the mid-17th century by local craftsmen; depicting scenes from the Old Testament and was. The house is furnished throughout in Victorian style but also contains some earlier 18th century furniture and tapestries. Lanhydrock House and its estate remained in the Robartes family until 1953 when it was given to the National Trust by the 7th Viscount Clifden. Outside the original 17th century gatehouse is the main entrance to the house and Victorian gardens. 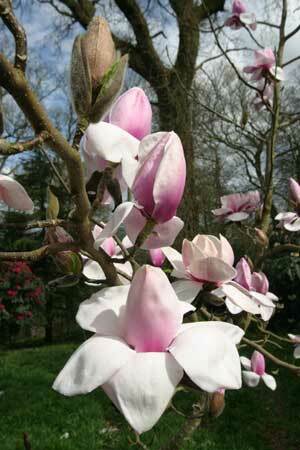 There are 22 acres of spectacular gardens at Lanhydrock containing herbaceous borders and formal parterres. The parterres have bronze urns brought from the Chateau de Bagatelle in Paris and taken to Lanhydrock in 1857. The gardens still maintain the 19th century plan. The wooded higher gardens contain rhododendrons, magnolias and camellias, subtly blended into the indigenous oak and beech woods. 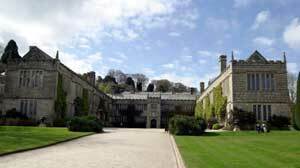 Lanhydrock has around 1,000 acres of woodland and meadows complete a network of footpaths. Attraction A Fantastic Day Out! Bed & Breakfast Self catering High quality 4 star rating Bed and Breakfast accommodation - All rooms are ensuite. Our farm has the River Tamar as one of our boundaries. You are welcome to explore our beautiful countryside, ancient woodlands and river. We even have remnants of the old Launceston to Bude canal running through. There is a wonderful variety of wildlife to try to spot ranging from butterflies to red deer. Self Catering Two delightful self-catering cottages in a barn conversion , each sleeping up to 6. Located in the beautiful Tamar Valley. Absolutely ideal for exploring both Cornwall & Devon. Wheelchair access a priority with wheel in shower facilities and hoists available. Attraction Welcome to Bridge Bike Hire, the original Camel Trails Bike Hire Depot. Now recognised as one of the countrys top bike hire facilities complementing the popular and very scenic Camel Trail. Bed & Breakfast Welcome to our beautiful listed Georgian farmhouse with its spectacular gardens and view towards the north Cornish coast. Set in 2½ acres of mature gardens. Ideally located for exploring Cornwall. two spacious double bedrooms; each with a super king size and the other with a king size - one is en-suite. There are also two single bedrooms each with 3 ft wide beds. DOMAIN NAME Ideally placed for exploring Cornwall. Furnished to a high standard, very warm for winters and aircon for hot summers. Own private garden. Close to all ammenities and near by town of Wadebridge. Sleeps 2 plus cot. Well behaved pets welcome. Self catering + Domain Name Well placed for exploring Cornwall being within easy reach of the A.39,the North Cornwall Coast and local town of Wadebridge. Very well equipped accommodation for 2 people plus up to 2 dogs. Secluded enclosed garden with parking on site. Self Catering A comfortable, well equipped end of terrace two bedroomed cottage with attractive enclosed back garden. The picturesque and friendly village of St Tudy, with its pub and shop, is an ideal base for exploring all of Cornwall. Sleeps up to 4 people, well behaved pets welcome. Self Catering HOLIDAY COTTAGES WITH HOT TUBS 2/4 AND 6 BED COTTAGES.Two Fishing lakes and direct access to Uks Premier National Trusts LANHYDROCK HOUSE 500acres estate.15 minutes to EDEN and Beach with Pub and restaurant.See my website with availability page and prices. Self Catering + Camping + Caravans + Tourers A peaceful holiday retreat of 7.5 acres, with a choice of self- catering accommodation lodges, We are a family run site set in 8 acres of woodland, tucked away in a peaceful little valley not far from Bodmin. No bar or entertainment, centrally located. On the Camel Cycle Trail. David Bellamy Gold Award for conservation. Self Catering Six stone cottages imaginatively converted from traditional farm buildings, dating from the 1800s, arranged around a delightful, atmospheric courtyard. Garden with BBQ, childrens play area, games room and laundry facilities. Bed & Breakfast A great value B & B offering a warm welcome and comfortable accommodation close to Bodmin town centre. With pubs restaurants and many places of interest to visit, all within easy walking distance. Free Wifi - available 24/7. The accommodation is 200 yards from the Camel Trail - walking and cycle track.